Does this not look like the fanciest desert ever? Yeah, it’s also the easiest! It’s my little riff on Ina Garten’s Apple Tart. I make the apple version all the time for dinner parties, because it’s delicious, easy to make and looks like you went thru ton of effort. A total fake out. I’ve decided to quit winter, like I’m so done. I’m full on grilling burgers while sporting flip flops…ok so I’m grilling in my snowsuit, but I’m still grilling! 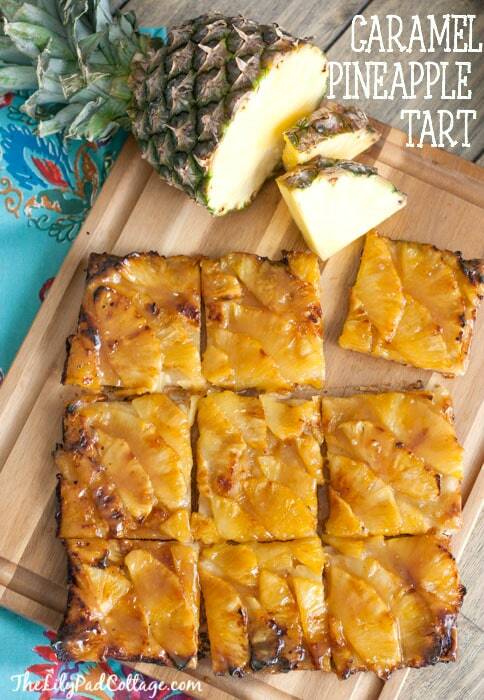 Pineapple tart screams tropical summer time weather to me, so I thought I’d give this recipe a twist with pineapple. And oh my yum! Sooooo good! All you have to do is roll out a piece of puff pastry. 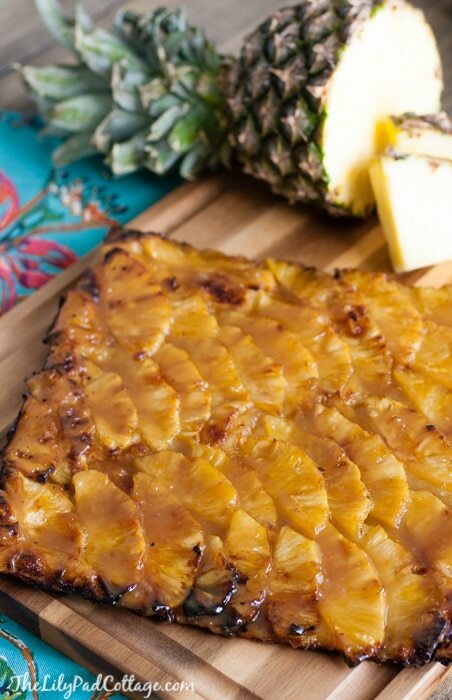 Slice up your pineapple and layer the pieces all fancy. Sprinkle with sugar, dot with butter and pop it in the oven! I drizzled a little extra caramel sauce over the top when it came out, which is optional, but so good! Roll out puff pastry on a cookie sheet lined with parchment paper or a silicone mat. 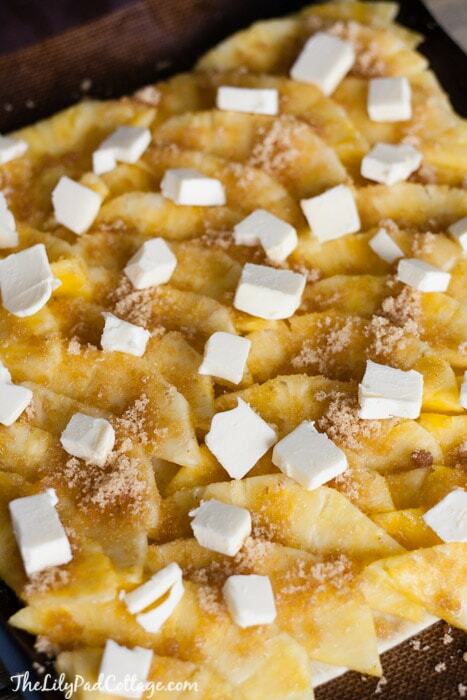 Layer sliced pineapple on top of the pastry. Bake for 35 - 45 minutes or until the puff pastry is golden brown. Brush or drizzle with caramel sauce before serving. Melt ¼ brown sugar and 1 tbsp of butter together until bubbly. Add 1 tbsp of heavy cream stir together and brush on the tart. How about sprinkling some coconut on it and we’ll call it a Pina Colada?? It looks delicious and I’ll definitely pin this and the apple version for future baking. Really like easy. Thank you! Don’t they make winter flip flops? Love it, I actually thought of that but didn’t have any on hand, totally trying that next time! You’re making me quit winter right in the middle of a snowstorm today. Going to do this for tonight’s dessert. For a little French twist, try cooking it with a few twigs of fresh rosemary on top (then discard). Delicious! OH yum, Rosemary is a great idea! I’m done with winter as well. I live in Boston where they have resorted to trucking the snow out because we have so much of it that it is near impossible to maneuver the streets. This Pineapple Cake looks a-MAZ-ing. And you are right. . .it does look fancy. Pinning for the next dinner party when i need to impress. My husband absolutely loves pineapple, so will need to try this. Looks so yummy and easy enough. I think we are all wanting a little something tropical at this point in the Midwest! :) Thanks Kelly. I wonder if you could GRILL one side of the puff pastry, turn it over add the pineapple, butter and sugar then continue grilling at a lower temp till done…. Either way looks good and gonna try it soon! Hmm you could try it! Let me know if you do! Serve warm or at room temp? Does this get soggy if it sits post cooking? You can serve it either way, it gets a little soggy by the next day but you could totally make it in the afternoon and pop it back in the oven that evening to warm it up a bit. Pineapple cake look s so good.